Navigate to New >> Page - Longform. Complete Inline Metadata and Social Media sections. Reference New Page for guidance on these sections. For the Banner, select the Type. You can select a Banner Image or Video. For a Banner Image, ensure that your image has been uploaded to the WCMS and has the correct dimensions. Check the boxes for Full Screen, Parallax, and Title Overlay as desired. 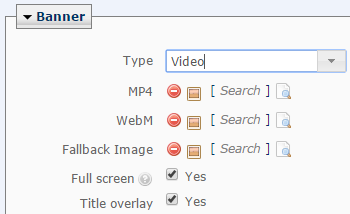 For Video Banners, attach the MP4, WebM, and Fallback Image. Ensure that your media files have been uploaded to the WCMS and have the correct dimensions. Check boxes for Full screen and Title Overlay as desired. 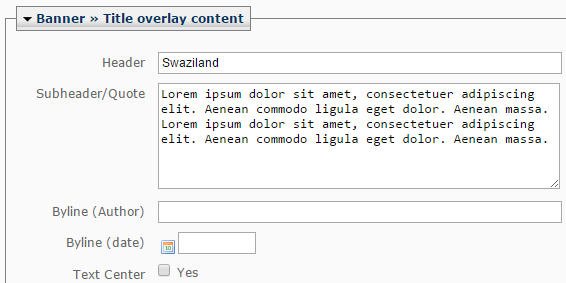 If you selected Title Overlay, enter the Header, Subheader/Quote, and Byline Author/Date. Check the box if you want the Text Centered. Under Section, click the green [+] to add sections. Add sections if you want to change a background color or add a banner. Choose Section Type. Select 100% under Column Layout. 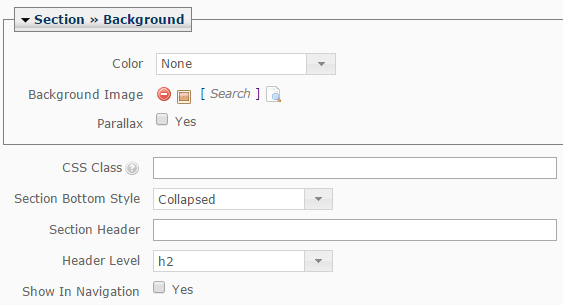 Complete the fields under Section >> Background. Refer to the new Page for guidance. In Section >> Column >> Chunk, choose from a variety of chunk types for building your content. Click the green [+] to add chunks. If you want to add an image, video, or pullquote to a text chunk, create an inline element. After the chunks and sections have been added and completed, Submit and Publish.